Like a lot of chicken owners, I struggle to get anything green to grow in my chicken coop. Last spring, totally out of space in my garden, I decided to experiment with growing watermelons vertically up the “trellis” of my chicken coop’s run. Growing vining plants vertically and keeping chickens can go hand in hand and make great use of space. Below are some photos of a watermelon vine growing up from where I’d tucked a leftover plant into the ground next to the coop when I ran out of space in my prepared garden beds. Planted just outside the chicken run (and with a bit of wire mesh placed around it to protect it from the hens on free-ranging days) the plant thrived all summer. Every week or two I’d redirect any tendrils wandering along the ground up onto the wiring of the coop. Eventually the vine spanned across an entire side and onto the roof, providing shade for hens in the summer. previous scratching behavior by chickens had loosened soil and removed competing plants. 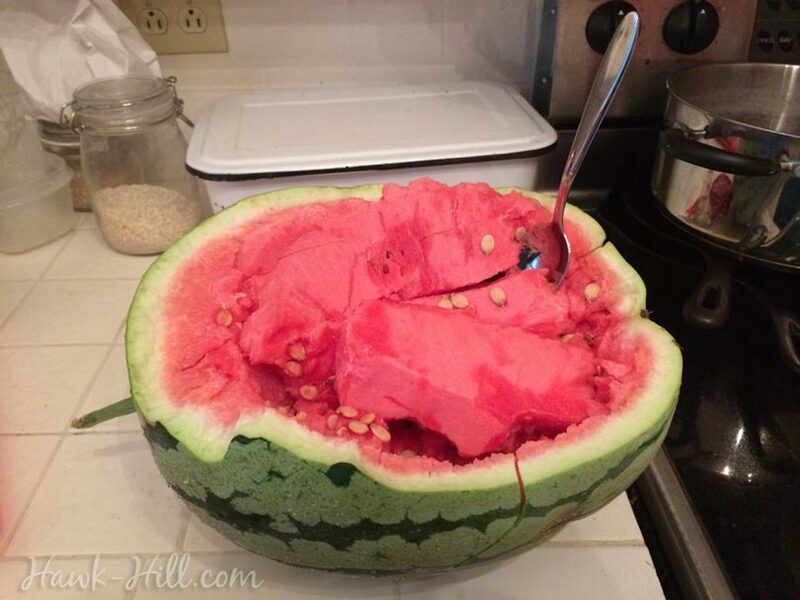 at least in this experiment, chickens don’t eat watermelon leaves. the coop provides structure to lift the vines of the watermelons so instead of taking up massive garden square footage, they grow up and over an existing structure. 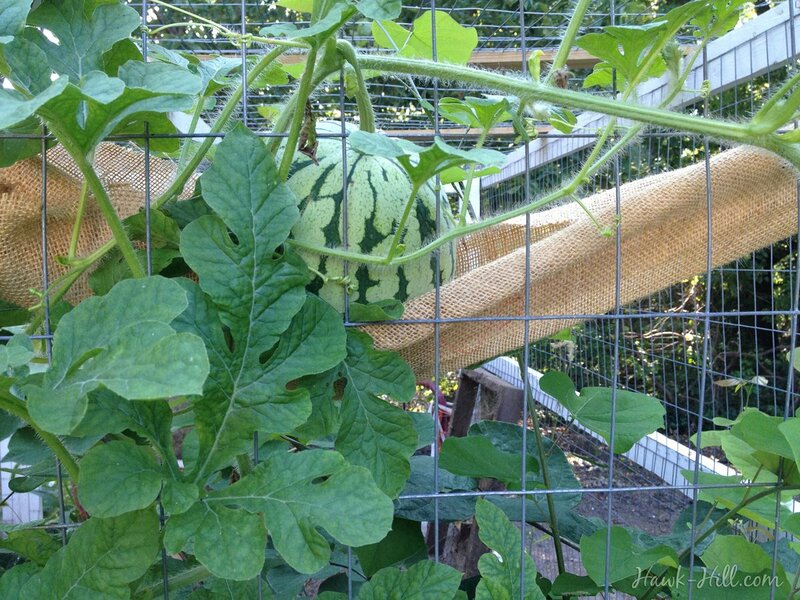 When my watermelon vines began to set fruit, I tucked the tiny watermelons between the wire mesh and inside the coop. 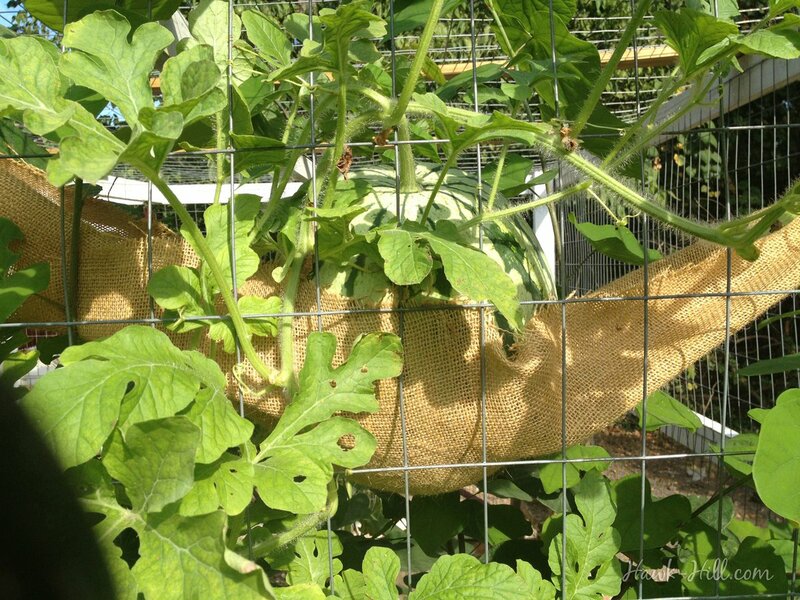 Far over the chickens’ heads, they were unnoticed by the birds, while the wire mesh protected the growing fruit from garden pests that nibble melons. The prolific vines of watermelon provided much-appreciated shade over the coop during the hottest part of the summer. I was pleased to find that either the hens didn’t like the taste enough to peck at the plant through the wire mesh, or just were not able to do much damage given that so little was within reach of their beaks. 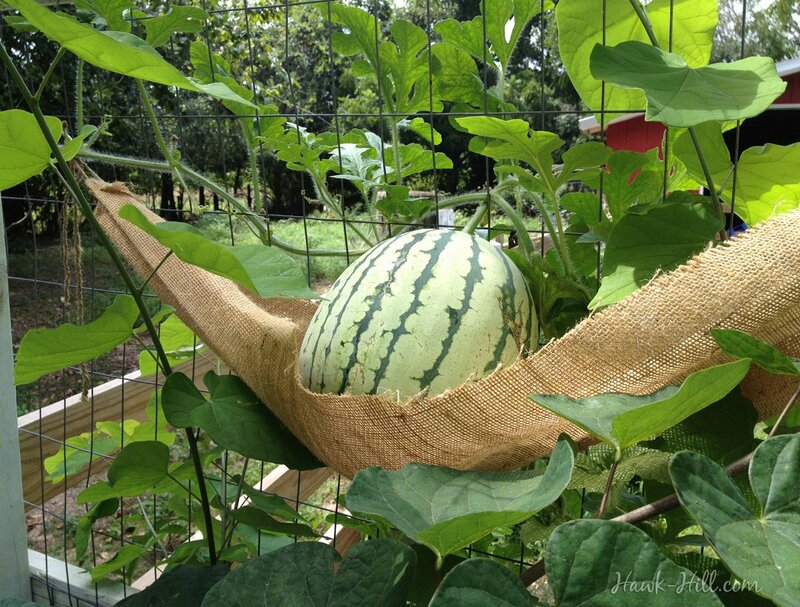 As my watermelon vine extended up the chicken coop, I constructed a sling with burlap to bear the weight of the melon until it was ready to harvest. This is great! I never would have thought about growing watermelons next to the chicken coop. I think this is a brilliant idea and I will be doing this in the summer. Thanks!